Larvae feed on Entada phaseoloides (Matchbox bean), a vigorously growing vine chiefly found along watercourses in higher rainfall areas. Mature larvae have a bright green body and a pale brown head. 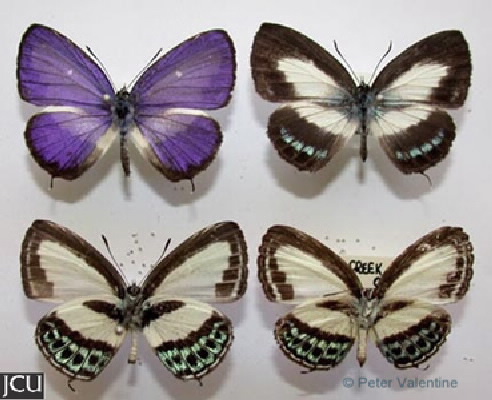 Adult male is purplish-blue with a narrow black band on the edge and a white patch in forewing; female is black with broad white central band in fore wing and some iridescent blue patches. Lower surface basically white with black band, iridescent green band enclosing some black spots towards margin of hind wing. Small thin tail on hind wing.